Click on Insert and select a Module 4. You are tasked with covering your boss's critical work for the entire week. Step 1: Create a new simple excel file. A Generous License With the purchase of the Password Removal add-in your license agreement will permit you to download the add-in on up to 5 of your own personal computing devices. Redirecting Of Banned Users provided by - Copyright © 2019 DragonByte Technologies Ltd. If you are following our blogs on a regular basis then probably you have gone through the blog where Rishabh have very clearly shown to us that. You can only view the content of that sheet or edit on that section where it is not locked. 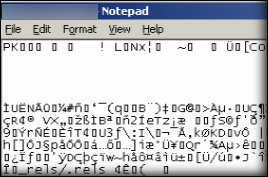 Step 6: With the help of Hex Editor, open the file in which you want to crack the password and paste the above copied lines from the dummy file. Recover Multiple Worksheet Passwords The Password Recovery add-in will produce a separate file with a summary of it's finding during the un-protecting of multiple worksheets. Method 4: Step 1: First, open the workbook in which the protected sheet consists. John Cross Database Analyst at Operation A. This site contains affiliate links. 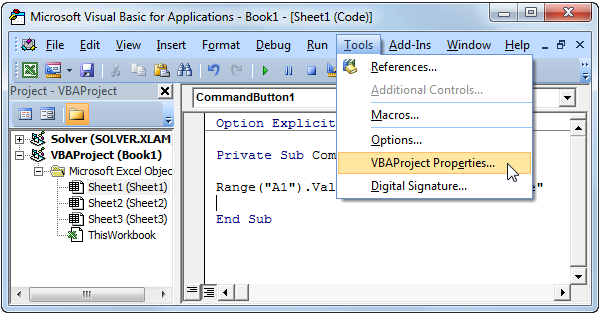 Macro to unlock VBA Project? Choose Encrypt with Password option 11. Everyone who had previously purchased the add-in, received the updated version for free via email! Step 4: Enter Tools-Macro-Macros and double-click on PasswordBreaker in the list. It is a file extension for a visual basic file and contains the visual basic source code. Important Note: The manual solution works when the password is within 7 characters only, if it exceeds than 7 char, then try the second solution. 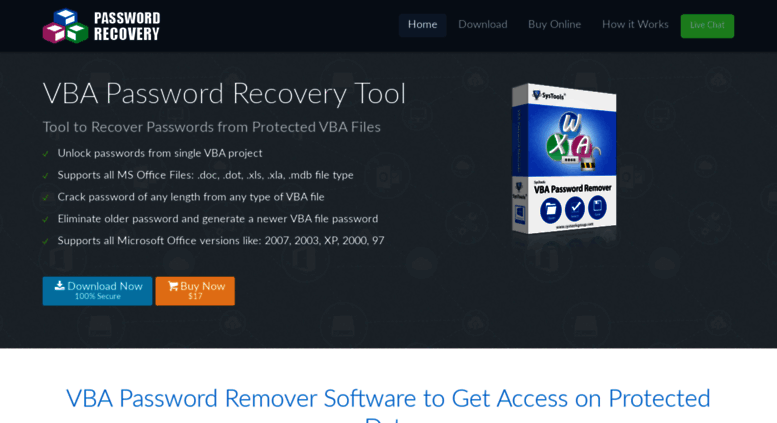 Product Features Free Version Full Version Supports instant password recovery of any length and complexity. Insert the code below in the general declarations page you have opened. View our , , and. How to unlock protected vbaproject in a excel file from C#? Usually, we kept these files protected using a password. If you have lost or forgotten the encrypted password from a Microsoft word document and want to unprotect that file then, this is the right blog to get the solution. This basic source code boosts the functionality of these applications. I am trying to unlock a password protected excel sheet using code found I am successfully able to unlock the excel file, but I do not want the user to see any windows. Because it has attracted low-quality or spam answers that had to be removed, posting an answer now requires 10 on this site the. It also has ability to unlock the old password, which is very long. I'm excited to announce that we have added few new features to the Password Recovery Excel add-in based on feedback from current users. Step 4: Now, open the file which you have recently created with a hex editor. Let us have a look: 1. After a few minutes, a small pop up box will get open. You cannot do anything on that sheet If your excel sheet is password protected. Step 6: Again, change the file extension from. Are you someone who spend days on collating data, making charts and updating formulas and still feel like no one reads it anyway? In the Review menu tab click Unprotect sheet. Activate ' now use lovely SendKeys To unprotect Application. Simply click the Help button drop down and navigate to the Add-in Help Pages section. Step 7: Open the Visual Basic inside Excel an then. Unfortunately employees leave, passwords get lost, and minds forget. Save the changes made in the file and close it. Sort of a boring pre-holiday Friday on the left coast so I thought I'd provide an example of how the oft-maligned SendKey approach might have applicability to accomplish something obscure. It's Monday morning and you are ready to get to work in Bob's Excel file but you lost the password he gave you to access it! Would you like to answer one of these instead? If not, you'll probably need to access your Office suite installation disks to install the necessary programs. So what's there to lose? This can be handy if you unlock a dashboard that has all of the tab navigation hidden. Enter and confirm a password. After considering the above scenario, we have discussed a direct manual way to resolve such type of issue. Now if you want to write something in the sheet then you will get a message that the sheet is protected…. All contents Copyright 1998-2018 by MrExcel Publishing. One of the ways to achieve this is by using strong password to restrict unauthorized access. There's another thread from 16Jan02 that is concerned with the same topic. The quantity of Tab lines is variable depending on your add-in and current project task situation. Step 7: Now, save the excel file and exit. It does not matter which Excel program you open the protected file with this means you can use this add-in inside Excel 2013 , it only matters that the worksheet or workbook-level protection was added by Excel 2003-2010. You will receive several error messages, simply dismiss them all and yes, there can be quite a few! Click on Insert and select a module. You have Unlock password protected excel file online free. Good Job……: : : Like. Enter the generated code as the password and your done. Click on xl Folder and double-click on it to extract vbaProject.